Names changes are fairly common in modern Israel. Scholars in the recent past have referred to the river that flows from Banias as the Nahr (River) Banias (Nelson Glueck, The River Jordan, 1945, p. 17). The latter is the name that has endured to this day. The Arabs call it Banias, because every p becomes a b in their pronunciation. Here is one of the photos I made during a clearing on a rainy day in mid-April. 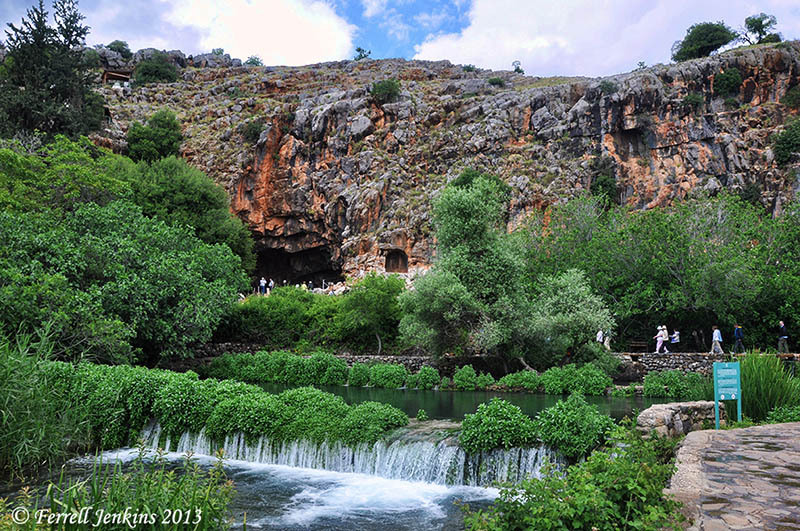 The site of Caesarea Philippi. Photo by Ferrell Jenkins. The Israel Nature and Parks Authority now call this area the Hermon Stream Nature Reserve (Banias). At the point where the springs now emerges from the ground, this sign can be seen. 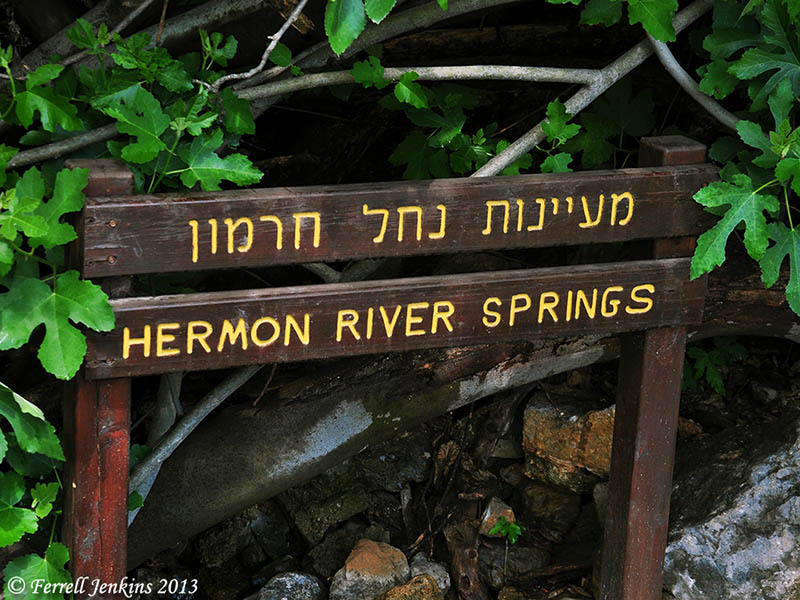 Sign at the source of the springs denoting them as the Hermon River Springs. We shortly lose sight of the stream. 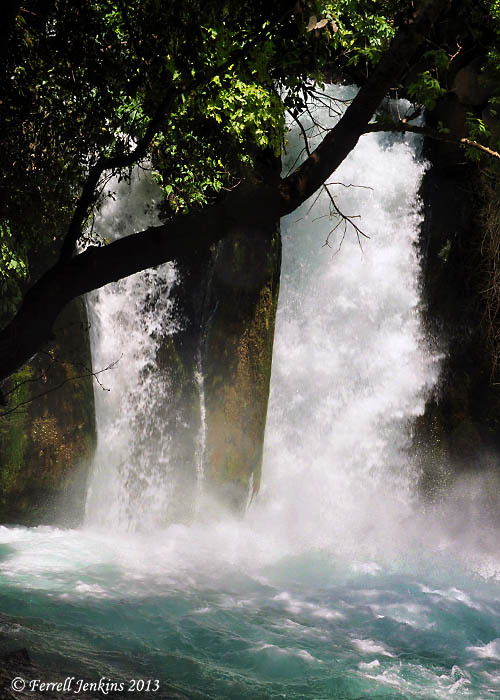 About 2¼ miles southwest of the source, the stream emerges as the beautiful Banias (or Hermon) Waterfall. The Banias (Hermon) Waterfall. Photo by Ferrell Jenkins. As the river continues south, it soon merges with the other streams and becomes the famous Jordan River. I am rather certain in my mind that a decade or so ago this waterfall was identified as the Jordan River Fall. Technically, of course, it would still be the Banias or Hermon. One can see why Israel would name the river the Hermon rather than call it by the Arab name Banias. But, it sometimes gets confusing — just like Bible translations of similar names. This entry was posted in Bible Places, Bible Study, Israel, New Testament, Photography, Travel and tagged nature, waterfalls. Bookmark the permalink. A few years ago I drove up to the top of Hermon and stopped off at the waterfalls on the way down. I missed seeing the start of the river at Pan, I guess. The very loud sounds of the water falls were almost deafening. The sites were outstanding. The next time I’ll stopover at Banias two or so miles above the falls.